BSA bobber has a surprising Royal Enfield feature. 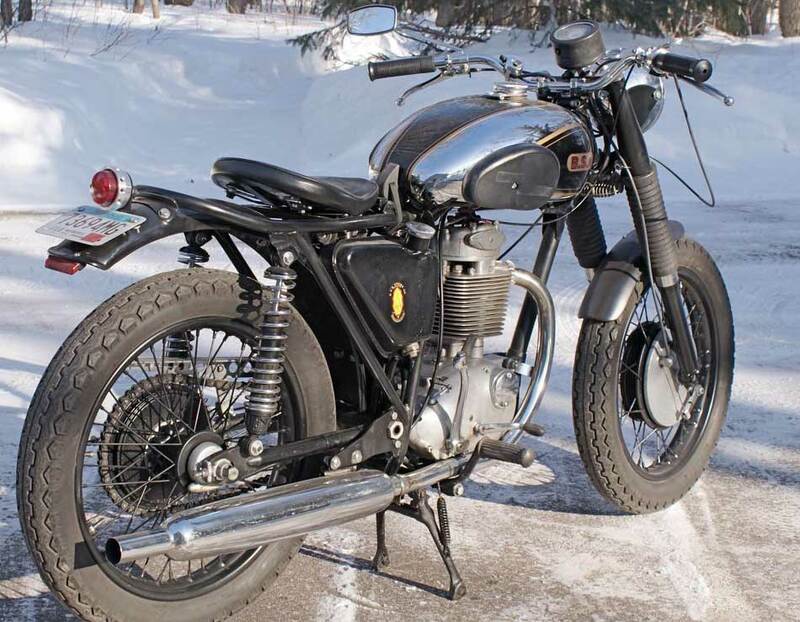 Donald McMahan writes from snowy Minnesota about his BSA bobber. He previously shared the story of his Royal Enfield Interceptor and Royal Enfield Indian Chief with us. The bobbber looks great, thanks in part to his familiarity with fiberglass work. "I saw the mention of a '60s BSA single on your blog and couldn't resist presenting my latest project, completed this last summer. "I wanted to buy a 1968 BSA B44R 441 Shooting Star new, but couldn’t afford it. Instead, for my first real motorcycle, I bought a 1968 Yamaha YM-1 305cc for a little more than half the price of the BSA single. A friend of mine had a 441 Victor, the “scrambler” version with a high pipe. I loved riding behind him, listening to that fine British single-cylinder exhaust note. "Again, in 1970 I looked at a used Shooting Star, but had enough experience by then to know that I wasn't fully capable of doing all of the maintenance to keep it running right and couldn't afford paying a shop to do it. I ended up with a Honda 750; the only maintenance required was oil changes and chain adjustments. Those, I could do. "I found a used Shooting Star in 1986 for about the same as I would have paid for a new one in 1968. Either it held its value or inflation has beaten up our dollar, depending on how you look at it. The bike was completely stock with the fiberglass gas, oil tank and side cover. The single cylinder starting procedure intimidated me for a long time. I would ride it only on weekends and never go anywhere I would have to shut it off for very long. "Over the years I learned to take the carburetor apart with a screwdriver and a pliers in a ditch alongside the road — don't ask, it got me home. Before we had cell phones, my wife would remind me to carry change for a phone call every time I rode the BSA. "George Helm put in an electronic ignition and the mysteries of adjusting points and timing came down to a simple twist of the plate. I got tired of the fiberglass and fished the Victor oil tank out of the bottom of a pile in a motorcycle junk yard. 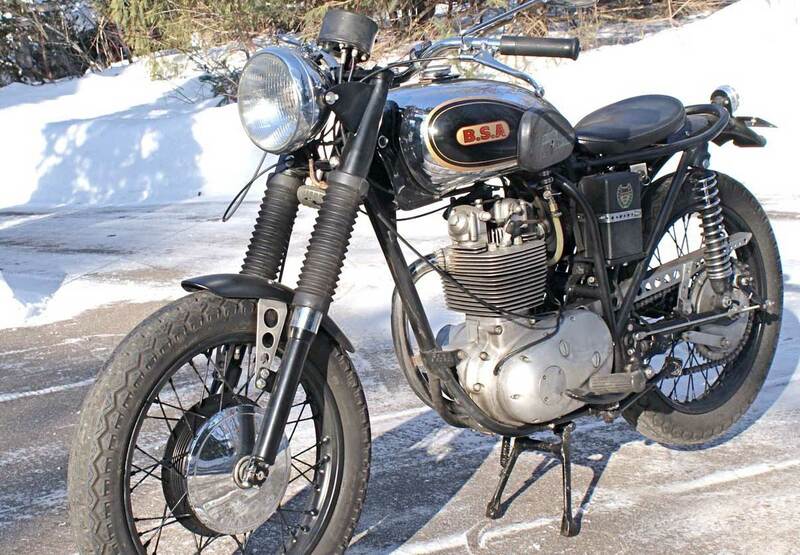 "For a while I went with a dented chrome A-65 (650cc) BSA gas tank that I got from George. I painted over the bondo-filled dent for a mostly chrome look. With the stock chrome fenders it didn't look too bad. "Life gets busy and I never did rely on this bike as a daily runner, and it sat. It hadn't been run in eight years when I started working on it again. "I've always loved the bobbers of the '40s. That was my goal, but I didn't want to do any major cutting on the frame. I removed most of the bosses and bracket for the stock fenders, horn, etc. "There have been a few occasions when I rode without a front fender while I was working on different bikes; that's one bit of pure bobber design I know I can't live with. A face full of road grit isn't my idea of a fun ride, so I made a fiberglass front fender that hugs the front wheel and is as small as possible. A year and a half into the project I retired. Soon, the BSA was coming together. Did you spot the Royal Enfield influence? "I imagine that you may have guessed the gas tank is from India and would be at home on a new Royal Enfield. I scrubbed the Royal Enfield script from the knee pads with a razor blade and a light sanding. "Both fenders and battery box are fiberglass, taillights are LED. The battery box holds a gel cell. I created other various bits using stainless and some aluminum. I think that the big stock headlight looks right, a personal preference. That's what bobbers are all about. "I would like to change the pipe and muffler for something smaller, but as I get older I don't like loud and I don’t think there’s a quiet option that would look better. "After much fitting and refitting I bolted everything down tight, put some fresh gas in the tank and plugged in the battery. After a couple of priming kicks I turned the ignition on and it started on the first kick, no kidding. "I trust it now and love taking it out, stopping and allowing people to see it, then go through a bit of a show kicking it through to get on my way. "Call me a criminal if you must for destroying a stock Brit, but I like it and I ride it." There is nothing criminal about taking a good bike and making it better. Tweaking the machine to fit you, your personality, and your riding style is really what makes this hobby great. Stay warm over there in Min-a-snow-da. inspiring story Donald. your bike exudes a lot of character and i like that very much. i don't see no destruction, only passion and beauty.